What do you think is the biggest problem facing sport/wellbeing at Strathclyde and how do you plan to resolve that problem? One of the biggest problems in sports and wellbeing is getting people to actually come turn up and play sports both recreationally and competitively. Sports clubs can be seen as being part of their own ‘clique’ and people can often feel intimidated about joining in, which should never be the case! From firsthand experience in the netball club I know clubs struggle to hold on to new players, especially recreational players. There are also not enough international students playing in our sports teams who have the ability to vastly improve our team’s performance and rankings. I want to encourage as many people from as many different backgrounds as possible to play sport because a healthy lifestyle is so important and playing for a team, or even recreationally, can massively enhance students’ university experience. I want to continue to keep sport at Strathclyde as accessible as possible to all individuals. As a female, I am aware of the hesitations other women have about participating in sport or attending the gym, as it can be viewed as a male dominant environment. I want to ensure Strathclyde is a place where women can feel comfortable to join the gym as well as clubs and teams. As the only woman running across all six positions, this issue is particularly important for me. Increasing female participation – particularly in committee and executive positions – is a challenge faced right across the university, and one I believe I can improve. How does your previous experience in the Union qualify you for role of Vice President Sport & Wellbeing? I am the Events Officer on the Sports Executive this year. This has allowed me to be involved in the full workings of the Sports Union and make important decisions across various areas. Through this experience I have gained an insight into the work required to be VPSW and the way the Sports Union operates. During my role I have organised events such as the Captains Dinner and the Sports Unions Bus Crawl which, for the first time ever, filled two 59 seat coaches with sports students from multiple clubs including football, equestrian, netball and swimming. I also organised the fundraising event “Take Me Out”, the most successful Strathclyde student led event in history! This event made over £1190 for our Sports Union. It is events such as these which raise money that benefit clubs, providing them with better training opportunities, more events for team bonding and generally a more satisfactory sporting experience. All of these factors contribute to ensuring more wins for Strathclyde. Organising such successful events this year couldn’t have been done without the help of Strathclyde’s sports clubs and societies, who I have built up a strong relationship with throughout my time at university. I am also the Vice Club Captain of the Netball Club and this year the club has gone from strength to strength. We have introduced a new 3rd BUCS team who are currently in the running to be promoted, implemented weekly strength and conditioning sessions, which I deliver, and started a thriving new social media website. As well as this we have 4 girls, including myself representing the Scottish Universities team. In previous years I have also been the Netball Club Secretary, which involves organising umpires of our 5 competitive teams’ matches throughout the week and constant e-mail access. The club received no fines or penalties during the year where this was my role, a target which has never previously been met. This demonstrates my efficiency in any role I undertake, which I believe is an essential for any VPSW. What do you offer that Nick doesn’t? I’ve known Nick personally throughout my time at University; he is a good a good cricket player and has done a good job in his role on the exec. However I don’t believe he has what it takes to bring the Sports Union to the next level as Vice President Sports and Wellbeing. 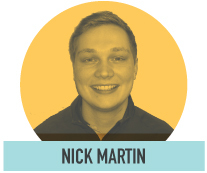 Despite his campaign slogan, “Think Big, Vote Nick Martin”, his ideas are safe and lack innovation. Nick states he wants to promote sports as ‘healthy student living’ however as my degree is in Sport, covering aspects such as Nutrition, Public Health and Psychology to name a few. I could fulfil this aim to a higher level due to my vast knowledge in the field. The sport facility issue he seeks to address is already in council plans and will happen with or without him being elected, it is something out with his control. Therefore I believe my campaign can deliver the ideas I have generated to a higher standard, as all of my ideas are within my control meaning they can be implemented and backed by all the students/sports clubs. What I have planned – a real plan for increasing funding, an app which is already in the early stages of being developed and introducing clauses in our Sports Kit contract to ensure the Sports Union and all of us are getting the best deal possible – will improve sporting success at Strathclyde. What has this year’s Vice President Sport & Wellbeing done well, and what needs to be improved? Mairi MacVicar has been a brilliant Sports President this year, she has promoted the “Healthy Body, Healthy Mind” campaign exceptionally; increasing awareness of the importance both mentally and physically of leading a healthy lifestyle. This is a campaign which I wish to continue and build upon if elected. She has also improved the relationship with our current kit sponsor Under Armour. There is still a long way to go before things are perfect but there have been fewer kit issues compared to last year and I will, if elected to ensure that number decreases again in 2015/16. If I was elected I would be able to continue to build on Mairi’s successes but also bring fresh ideas into the role. I think that the amount of sponsorship we receive needs to be improved dramatically, I aim to do this by approaching businesses in April at the start of the new financial year, rather than in July when previous sports presidents have begun their role, so I can get my foot in the door before they have allocated their budget. I also think there needs to be a big focus on increased media promotion through working with students who have film and media projects so that we have regular student media coverage and live streams of BUCS games. One of my main aims is to have a Sports Union mobile app with some key information to connect students with societies and clubs. Imagine having live Twitter and Facebook feeds, accessible information on how the Sports Union works, team bios, fixtures and results. All of this information, all in one place, all at just a swipe of a finger. This can all be possible as long as we Keep Calm and Vote Ann-Marie Kennerley. A disengaged student body is the biggest problem. You have a university of 20 odd thousand full time students and only 10% of them are members of a university sports club. I believe the way to fix this is for the Sports Union to have a greater focus on the individual clubs. If your experience of a club is positive you are more likely to join and stay. The way to create this situation is the Sports Union meeting up with the individual clubs and working out how to improve their club as a whole for the long term. Each club is different so the Sports Union needs to tailor their support to suit the clubs needs. This could be a coach, more training times or even help to engage their members socially. How does your previous experience in the Union qualify you for role of VPSW? I was a club captain in my first two years at university and the following year I was president. This has given me a huge insight into how a sports club is run and the problems that clubs occur during the academic year. I have experienced the trials and tribulations that all club committee face: funding, coaching, equipment, training times, kit etc. and have worked with various staff and presidents to overcome them. I have also sat on the executive of the sports union for two years now in two different positions. Last year I was the awards convenor and got a great insight into the varied achievements of the Sports union clubs. This year I am the current Vice President Development and have had a chance to be a part of the development of strategy and also gained a lot of knowledge on operational side of the sports union. I am also the current intern in the Sports Union and therefore already have a strong working relationship with the staff of the union. I have also volunteered at several of the well-being events that the VPSWs have put on throughout my time at university. What do you offer that Ann-Marie doesn’t? Experience in running a club and an established working relationship with the staff. I believe that I can provide some forward thinking; I have had four years at university and have been heavily involved in my sport and the sports union as a whole. Student sport is my passion and I would like to see it prosper and for the sports union to be in a strategically strong position when I leave. What has this year’s VPSW done well, and what needs to be improved? Mairi has done a terrific job this year. She has been organised and problems that have cropped up throughout the year have been dealt with swiftly and in the correct way. Participation is up again and the teams have been particularly successful. Her year has led to the sports union being in a position that we can plan for the future and, with a greater focus on development at club level, we can develop into the leading sporting university that we should be. Posted in Sport and tagged election, strathclyde, Student, vote, VPSW. Bookmark the permalink.